Originally published on genealogyatheart.blogspot.com on 22 Sep 2016. Excellent question! I went to my tree and checked the birth and death dates for the couple and their child and didn’t see that I had an error so I suspected my tree was confused with another; that was my reply. Yesterday, I received a more detailed response which brings up an excellent point. Under sources, I had saved for George Mitchell Long (Jr.) his parents’ marriage record. It does not show under Facts, of course, since the marriage took place before George Jr. was born. The record does not show Jr. or Sr. either since the Sr. hadn’t yet had a son so there was no Jr. at the time of the marriage. Why did I have the parents info on the son’s page? I put the record there so when I write kinship determinations I can pull everything from one page. I can understand how this would confuse someone looking at my tree and assuming I had the wrong information for that person’s page, though. I do this a lot, too! I’m thinking about how the Social Security info provides kinship and I save to both the parents and their child. That is clearer since it shows the relationship that a parents marriage alone does not do. I don’t know if there’s a better work around – if you know of one please let me know! I’ve requested that Ancestry add a feature like the shoebox to the Facts page so extraneous information could be saved and retrieved easily but I’m not holding my breath on that. Originally, I put info that I just described under the Notes feature but I had to move it out because I was working on some lines with other family members and they couldn’t see the Notes section – it’s only visible to the owner. For awhile, I then added it as a Comment but I wasn’t scrolling down and was missing my own comments. I see that now a click on comments on the toolbar brings the comments to the right side for viewing so maybe I should go back to using that. I Hate to Admit that an Unsourced Tree was Right! Originally published on genealogyatheart.blogspot.com on 24 Jul 2016. I do not want to start a genealogical war but I have to tell you about my recent experience with unsourced family trees and serendipity. I know it’s a touchy subject, the unsourced trees, I mean. Years ago – perhaps 16-20 – not even sure the exact time period I trusted what I found on the internet without checking sources. In my mind, why would anyone put out fraudulent information? I knew mistakes could happen but I really believed that everyone else was more knowledgeable then me so whatever was posted had to be mostly correct. That was until late one evening as I was happily clicking back on one of my husband’s lines and in the early morning hours, about 2 AM, I realized what was on the screen couldn’t be correct. There is no way that he was the grandson of Viking gods and goddesses. That painful lesson – painful because it took me quite some time to delete all of it – woke me up to reality. Unfortunately, there were other lines I had added information to prior to that realization and I had no way to verify accuracy of what I had recorded. All of it was Swedish. The data looked okay, meaning that the father’s first name became the child’s last name and the dates of birth and death looked correct so I just left it. I wanted to check but I just didn’t know how as I don’t read Swedish. Verifying the accuracy of those lines went on my to-do list for someday. I always could identify them because the PAF file I used had funny dates when I converted to gedcom – year-month-day instead of day-month-year. I am happy to report that the day finally arrived and I can cross this off my to-do list! In May I blogged about my purchase of a year subscription to Arkivdigital. That organization has digitized church books throughout Sweden and they look real, compared to the white background on Ancestry’s digitized books. The site works well, too! You can bookmark records, play with the background shading if you like and there is lots of helpful information to point you in the direction you need to search. 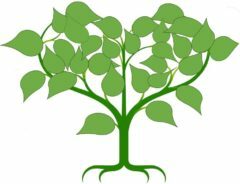 There are NO inaccurate tree leaves like on Ancestry to mislead you, either. Although the leaves are helpful in most cases they are definitely not correct when it comes to Swedish records and they make me crazy! I’ll be honest, I had my doubts I could use the Arkivdigital site since my Swedish language skills were limited to Ikea and Samuelson. Oh, and Huskqvarna. I did have a phone conference with the U.S. rep and watched her beginners video on Legacy Family Trees. I also went to Swedish Genealogy Center and poked around a bit. Arkivdigital has English translations, too, so I was able to print out marriage records, for example, from the 1700’s so I knew common words to look for. Although there was no standard way to record the records in the earliest church books the names seem to jump out in most cases. Probably because they are so long – Kierstin Johannessdotter stands out among the short words like fodelse (birth) and dod (death). I decided I would check those old lines and if they were wrong – Snip, Snap and Snur – they were getting cut! I am pleased to report that EVERYONE of them was 100% correct. That means that whoever put the info out there back in the early days of the internet really knew what they were doing. I just wish I knew who the person was so I could thank and credit them! I have entered citations for every record that I found – birth, death and marriage. I added a snippet to the gallery of each individual and made the birth record, in most cases, the photo so I can easily see the line was completely researched. I still have to go back and check out the household records and I want to add the sibling info, too, so I’ll be spending lots more time with Arkivdigital. Which gets me to the real lesson here – there are very kind, smart people out there in the world who do share their findings, albeit, without sources. Maybe, back in the day, their program didn’t allow them to enter a citation or maybe they just never thought to do it because they knew where they found it. Whatever the reason, no one should discount looking at unsourced family trees. I’m not recommending doing what I did – blindly copying – but getting ideas, contacting the owner and checking it out for yourself can really help you move forward. While I was updating my lines I discovered that my hubby’s dear 2 x’s great grandfather’s real name was not Anders August but Anders Ludvig Johannesson. He changed his name to Gust Johnson after he arrived in Indiana. I understand the Johnson part but the Gust? Well, turns out he was born in August so he went by a shortened version of his birth month. 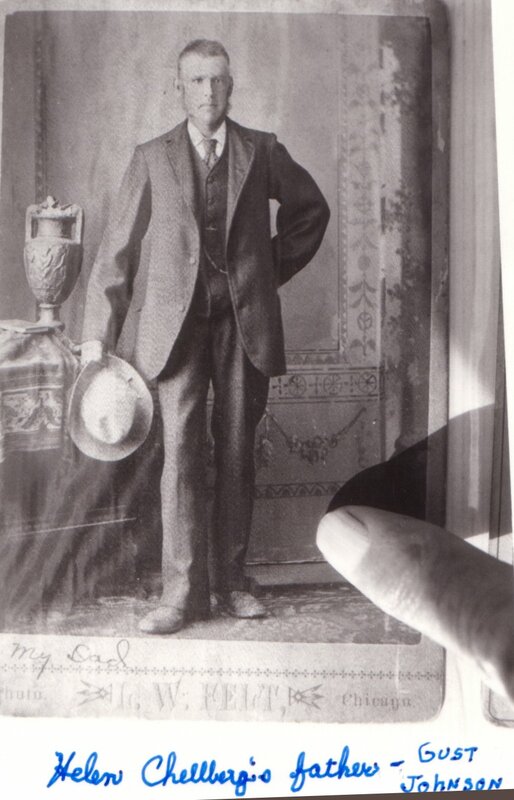 He died in the early 1900’s and we had no picture of him. I have his marriage certificate to his second wife but some darling in the family removed the pictures before I found them in a suitcase in my in-law’s basement about 40 years ago. I love the faint “My Dad” on the left side right under the pic. I suspect this is his 2nd wedding photo as he was 66 when he died and this looks like like a much younger man. The resemblance to my husband is striking. Notice that this appears to be in a photo book as the right edge looks like more pics. How cool is that! I so hope the gentleman responds and shares. Keep those trees and photos coming! So I found this just a few days before I left for my Pennsylvania-DC research trip. I came home late Thursday evening (thanks, southwest airlines for the debacle!) and began the arduous task of downloading to my desktop all the photos I had taken while away. Realizing I had hundreds, I decided to clean out my email first. Ok, this is really really weird but here goes…. I decided to read the weekly newsletter I get from the New England Historic and Genealogy Society. Why I picked that first I have no idea as I haven’t been doing anything with my New England lines this summer. One of the articles was about Hoosier newspapers so I clicked the link since I have been doing alot with Indiana. One click led to another and very soon I was on Porter County – Westchester Township pics and the first one that comes up…. was the Helen Chellberg handwritten above’s husband’s grandparents. How strange is that?! Porter County was a very rural area of Indiana back in the late 1800’s so there were several Chelllbergs who married into the Johnson and Samuelson families. In fact, on Thursday, I had been at the National Archives and got the military records for Samuel August Samuelson who’s sister married the man who popped up on the Westchester Township site. I thought that circle of connection was just incredible. All I have to say is – universe – keep it coming!!! 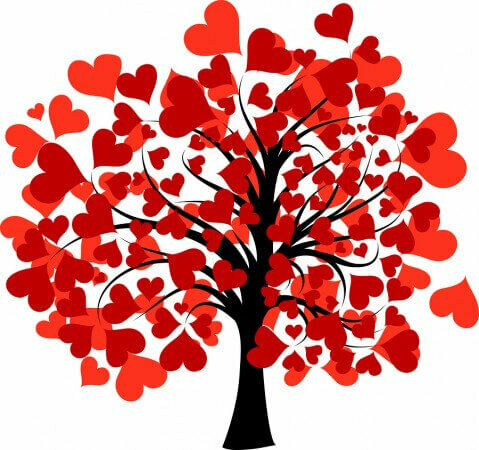 Author GenealogyAtHeartPosted on October 10, 2016 Categories Trends and MusingsTags Accuracy, Family Tree, UnsourcedLeave a comment on I Hate to Admit that an Unsourced Tree was Right! Originally published on genealogyatheart.blogspot.com on 18 Oct 2015. And then there was this interesting post in Myrt’s blog about ancestry’s disappearing records. It happened to me trying to retrieve my husband’s 3 times great grandfather’s obit info. I recently blogged about John and Mary “Mollie” O’Brien Cooke (A New Genealogy Society – What Fun! 11 October 2015). When I was checking my saved sources on ancestry.com for the couple I couldn’t retrieve the info for John’s obit. On the bottom right hand corner on the old ancestry version I could see the link under Source Info but when I clicked nothing appeared. I tried to do a search through the card catalog for Historical Newspapers, Birth, Marriage, & Death Announcements, 1851-2003 using John Cooke but there were no hits. I had a hard copy so I dug through my records and found it. I’m not sure if ancestry reactivated all the records they had blocked a few weeks ago because I tried it again yesterday and I was able to access it. Very weird! Having records here one day and gone the next is frustrating. That makes me want to save what I find in multiple locations to insure that the data isn’t lost. Another though I had was the idea of creating ebooks on my lines once I’ve obtained genealogical certification. I could then download the ebook and print a hardcopy. I would include snips of the pertinent records in the text so if the original disappears there would still be a picture available.